I've had these at P.F.Changs and they are just so dang good. So I set out to make an easy version at home. If you've seen my recipes before, you know that I really don't measure much. So I apologize in advance. Everything is just tossed in till it tastes right. And I add a squirt of mustard. You are going to toss everything in a skillet and cook until the meat is done. 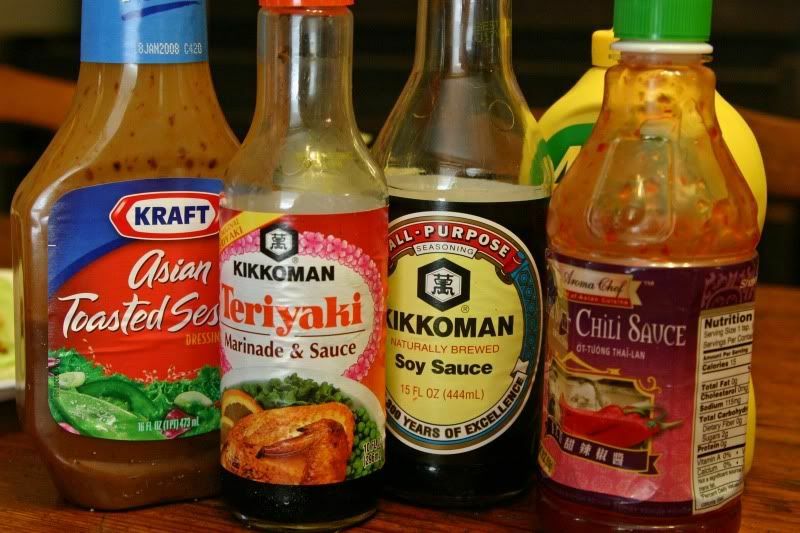 I use a Sesame dressing, but you could use Italian, or just skip it altogether. Your carrots and water chestnuts will be a bit crunchy and that's what you want. This will be BURSTING with flavor. Your sauce will be thick and syrupy. Perfect. At the last minute I decided that what I'd made didn't look like enough food to serve 5 people, so I threw in some cooked rice noodles to stretch it further. Spoon a bit of it into clean lettuce leaves, wrap it up, and enjoy! Another option with this is to make this filling, make a big green salad, and serve this on top! Asian Chicken Salad. **Oh! I almost forgot to post - The winner of the snack bag is Kari. Kari, please email me with your address and I'll get it to the seller. WARNING! Do NOT read while hungry! Now I have to make a trip to the kitchen, this just reminded me how hungry I was! We love these at P.F. Changs as well! I made my own version a couple months ago using the same ingredients and shrimp instead of chicken. Delicious and so easy! It was a big hit with my boyfriend. What a great recipe...thanks for passing it along. I love your blog. I just read your comment on Trendy Tyke's post "Oh.Emm.Jee." and I had to come check you out. I laughed out loud when I read that. I popped over here, read several of your posts and am now following you to read more. those looks wonderful. perfect for hot summer nights - although we haven't had any of those. oh my...yummy , seriously yummy! So nice & yummy on a hot summer day! I make something similar but use Stir Fry sauce instead. Also good over plain white rice (leftover rice). YUM! This looks amazing!! Thanks for sharing!! can you just come over and make them? now i am huunngggggggggrrryyyy! I love their lettuce wraps! I'm going out tonight, maybe I'll go there for dinner. That recipe looks great--I'll have to try it. YUM!! I love their lettuce wraps so I am def going to have to try this! Thanks for sharing!! Thanks for the recipe! SO YUMMM! Adding it to next weeks menu! OHH YUM!! And a picture too!!! Wish I could reach through my screen and grab a taste! I will have to try this one. Sounds quick, easy and tasty! Thanks for sharing! I love these at PF Chang's!!! So glad that you figured out how to make them, but must admit you're stressing me out without the measurements! I'm a follow-the recipe-to-a-tee kind of girl...looks like I'll pass this dish on to my DH, he just dumps and tastes! LOL! 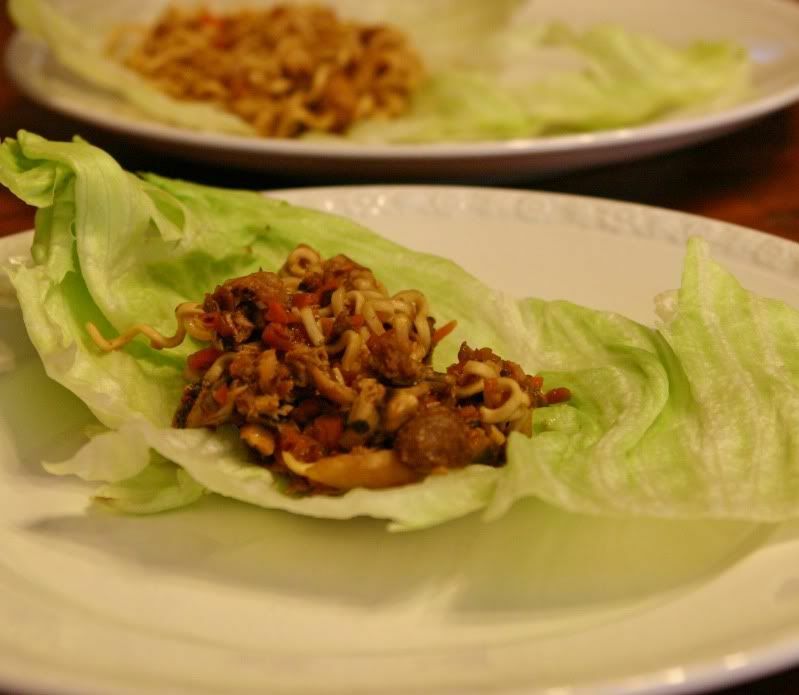 ah see what you went and did, now I'm craving Chang's lettuce wraps - YUMMMYYY! These look soooo good! Thanks! off to the market! not even joking! this looks GREAT! Oh my goodness!!! thanks so much for sharing the recipe!!! (these are my favorites!) yours look delish! That looks awesome! Going to have to try that! Sounds like we cook the same a dash of this a splash of that lol! These look so great! I love them but have never tried to make them myself I will have to try it out now! I love lettuce wraps! Thanks for sharing the recipe. oh man, this looks fantastic. I love the ones from PFChangs - I wonder if my kids would eat this?? tonight??? I love this idea, I am addicted to the wraps at PF Changs will have to try these.